Kids inspire us to look at the world differently. Their insights and optimism help us find the best in ourselves and in others. This unbridled belief in their ability to make an impact also makes them inspiring entrepreneurs. 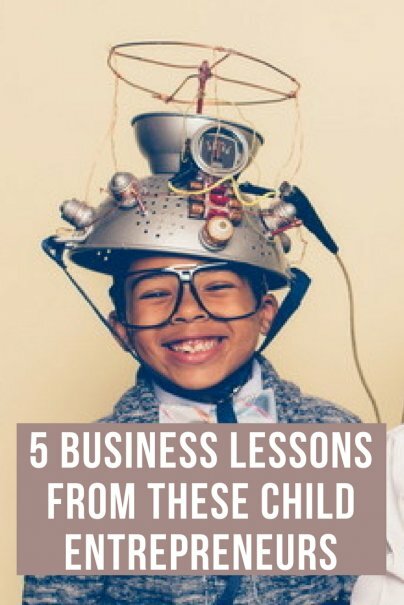 If you've ever had a business idea and doubted yourself, let this short list of kid entrepreneurs erase your fear and teach you the lessons you need to build the business of your dreams. Imagine taking a painful experience and rather than growing bitter, you get better. That's exactly what happened to Mikaila Ulmer. When she was four years old, she was stung twice by a bee. That would make many people afraid of bees, or at least dislike them. Instead, Mikaila was fascinated by them. Those bee stings gave Mikaila a mission: to learn about bees and their role in our ecosystem. In the course of that research, she learned that bees were dying at an alarming rate. Simultaneously, Mikaila also received an old cookbook from her grandmother that contained a recipe for flaxseed lemonade. She took that recipe, added local honey to it, started selling it at events, and donated a portion of her profits to help save the bees. Today, Me & the Bees Lemonade is going strong, flying off the shelves at Whole Foods and at many other restaurants and stores nationwide. And Mikaila? You can often find her speaking and educating people about bees and our ecosystem at events and on panels, and running workshops to save the bees. Her motto is "Buy a bottle. Save a bee." Her lesson to us: Find the silver lining. Spin an unpleasant experience on its head, look at the situation from a compassionate, curious perspective, and use what you learn to build a successful business. Imagine that you have the tradition of giving gifts to others to celebrate your birthday. That's the tradition in Neha Gupta's family. Every year, to celebrate their birthdays, her family members travel back to their hometown in India to give presents to orphans. Neha wanted to do more than just provide gifts to orphans. She wanted them to have the resources they need to create a better life for themselves as they get older. To fund this effort, she made and sold wine charms door-to-door and at community events. The wine charms became so popular that she attracted the attention of corporate sponsors who also supported her effort. With the success of the wine charms, Neha started a nonprofit organization called Empower Orphans. The organization has raised over $1,000,000, and Neha has won numerous awards for her work, including the International Children's Peace Prize. Her lesson to us: A rising tide lifts all boats. Passion for a cause can drive success not only for you, but for others as well. A few years ago, my mom gave me a locket to celebrate the opening of a play I wrote and directed in New York City. It's a metal locket with a glass center that has a charm inside. My charm depicts the tragedy and comedy faces associated with theater. It's a beautiful locket and I was so intrigued by how unique it is that I looked into the company that made it, Origami Owl. I learned that it was created by teenager Bella Weems. She wanted a car of her own, and rather than help her get one, her parents told her to find a way to earn the money to buy a car for herself. Bella always loved making jewelry and was particularly passionate about locket necklaces and bracelets. Origami Owl was born! In just two years, Bella had turned her passion for jewelry making and her desire to have a car of her own into a multi million-dollar direct sales business. Since then, she's empowered others to be designers and supported other kid entrepreneurs by being what she calls a Force for Good. Her lesson to us: Sometimes, entrepreneurs are born out of something as simple as wanting a new car. You never know what life event will spur you to create something successful. Then, when you find that success, pay it forward. Are bow ties fashionable? In the hands of Moziah Bridges, they certainly are! Hailing from Memphis, Tennessee, Mo founded Mo's Bows. Mo learned how to sew from his grandmother and mother, and his very first ties were crafted from vintage fabric he found in his grandmother's closet. His bow tie designs have been so successful that he recently inked a licensing deal with the NBA. His next goal? He wants to finish school in Memphis so he can attend Parsons School of Design in New York City, and develop his own full clothing line by the time he's 20. His lesson to us: Follow your creativity and perfect your craft. Produce a quality product you are proud of, and success will ultimately follow. The best products are born from pain points: That's a main tenant in product development. Find something that ails you or someone else, create a solution, and build a business around that solution. Lily Born saw her grandfather struggling with Parkinson's disease. One of the primary difficulties for people with Parkinson's is the tremor that makes their hands shake. Lily's grandfather was having a hard time holding and drinking from a cup because of his tremors. She designed a cup that wouldn't tip over and would prevent her grandfather from spilling his drink. She found this design was also helpful for her father, who was prone to spilling his coffee on his computer when he was working. The seed of her future company, Imagiroo, was in that original cup design. Her cups are now available in a durable plastic material with comfortable grips and in a wide variety of fun colors. To encourage all of us to imagine a better world through better products, Lily also created the Invention Workbook. It walks readers through the invention process, and is available for free on her website in PDF format. Her lesson to us: Don't overthink it. Sometimes, the answer is right in front of you. Solving a common problem with a simple solution is often all it takes for a business to flourish.